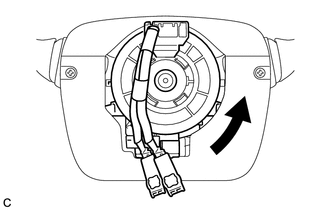 Do not replace the spiral cable with the battery connected and the ignition switch on (IG). Do not rotate the spiral cable with the battery connected and the ignition switch on (IG). (a) Check that the front wheels are facing straight ahead. (b) Set the turn signal switch to the neutral position. 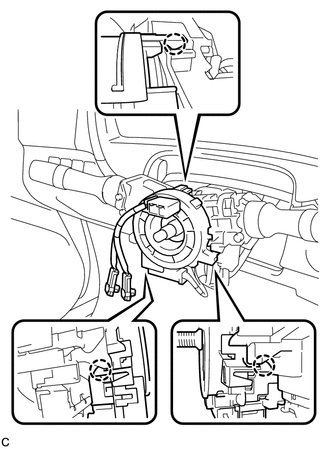 If it is not in the neutral position, the turn signal switch pin may snap. (c) Install the spiral cable with sensor sub-assembly with the 3 claws. When replacing the spiral cable with sensor sub-assembly with a new one, remove the lock pin before installing the steering wheel assembly. (d) Connect the connectors to the spiral cable with sensor sub-assembly. (c) Rotate the spiral cable counterclockwise slowly by hand until it stops. Do not turn the spiral cable using the airbag wire harness. 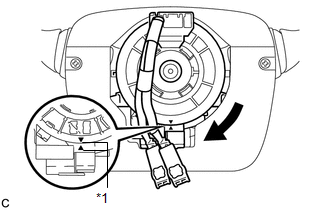 (d) Rotate the spiral cable clockwise approximately 2.5 turns to align the alignment marks. The spiral cable will rotate approximately 2.5 turns to both the left and right from the center.